Indonesia and Russia are still locked in talks over the procurement of up to 10 Russian-made Su-35S multirole fighter jets, an Indonesian defense official told Reuters during this year’s Indo Defense 2016 Expo and Forum, held on November 2-5 in Jakarta, Indonesia. The deputy director of Russia’s state arms exporter, Rosoboronexport, confirmed to Russian media that bilateral talks are continuing. “Bilateral talks on the delivery of Su-35 multirole fighters are being conducted very actively,” Sergei Goreslavsky said on the sidelines of Indo Defense 2016 on November 2. No contract has been signed so far. It was then announced that the official signing of the agreement would occur in March 2016 when Ryacudu would be visiting Moscow. The signing of the contract, however, again did not take place, with the date being pushed back to April. The new deadline also passed with no inked deal. 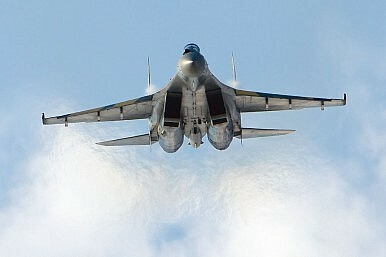 As I noted elsewhere (See: “Indonesia and Russia to Ink Deal for 8 Su-35 Fighter Jets in May”), the Indonesian defense minister then announced that an agreement over the procurement of eight fighter jets would be signed during the Russia-ASEAN Summit in May of this year; yet again no signed contract emerged. Consequently, it remains to be seen whether the current negotiations will produce a signed agreement anytime soon. There have also been conflicting reports over the total number of aircraft to be purchased. First, Indonesia considered buying 16 new warplanes. This number went down to 10 as talks progressed. According to press reports, both sided eventually settled on eight, with an option of procuring two additional Su-35s in the future. The contract under negotiation also includes pilot training and knowledge transfers through a military exchange program. [The TNI-AU] presently consists of 14 F-16A/Bs aircraft, six (some sources say 12) F-5E/F fighter jets, five Russian-made Su-27s and 11 Su-30s, as well as 15 Hawk 209 sub-sonic light combat aircraft used for training purposes. The TNI-AU is also involved in funding South Korea’s KF-X fighter jet initiative and plans to eventually procure 80 new fighter aircraft from the program. The TNI-AU is expecting the delivery of 10 more F-16 fighter jets by early 2018.